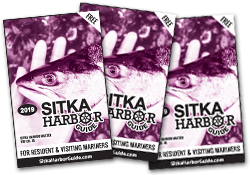 At a number of Sitka embarkation and debarkation points, residents and visitors have been delighted by the distinctive metal signs. 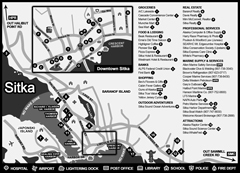 Lee’s sign welcomes you to ANB Harbor. 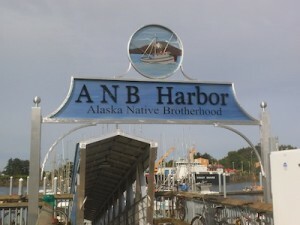 At the entrance to ANB Harbor on Katlian St., a white and brown aluminum rendering of a troller on blue water floats above metal letters. 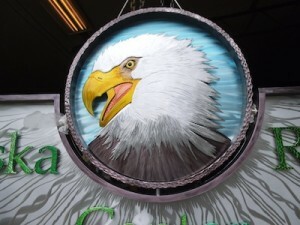 Halfway up Raptor Way, the road to the Alaska Raptor Center, a metal eagle sports a prominent yellow beak and silvery white head feathers. 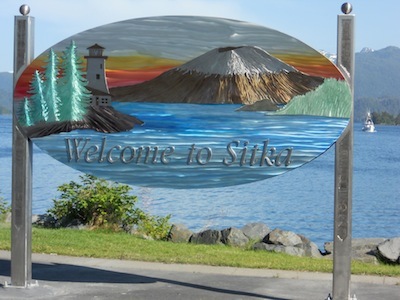 At the cruise ship lightering dock beneath the O’Connell Bridge, a two-sided “Welcome to Sitka” sign is a 10-foot wide study in the textural, tinted and heat-induced color possibilities of art using steel, stainless steel and aluminum. 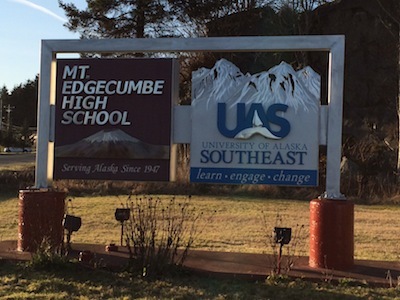 These and other metal signs around Sitka are the work of Marcus Lee, operator of LeeCraft Metal Fabrication for more than 20 years. A compact, bearded man with a strong voice, the more practical demands of Lee’s busy Halibut Point Road shop leave little time for his artistic side. It’s been nearly two years since he has completed a metal artwork. 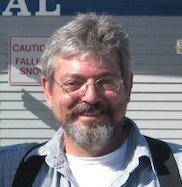 Luckily, Lee already has a body of work available for public viewing.Besides the signs at ANB Harbor, the O’Connell Bridge lightering dock and the Raptor Center, Lee’s work can be seen at the entrance to the University of Alaska Sitka campus and at the Sawmill Creek Road headquarters of the Northern Southeast Regional Aquaculture Association. NSRAA liked Lee’s work so much, they also have his signs at two of their remote hatcheries. A number of private homeowners display smaller works by Lee that they have purchased. “My wife Faith tells me I have to say `no’ to the rest of work, in order to make time (for art projects),” Lee said. When you run a small business it’s difficult to turn down the bread-and-butter customers. But Lee is considering the shape of a possible future retirement. Lee was born in Seward, Alaska in 1955, but lived in towns all over Washington state — due to his ironworker father’s “itchy feet.” Lee says he grew up in a metal shop that made ornamental grills for doors, gates and railings. He became comfortable with the heating, bending and welding of metal. His older brother joked that Lee was getting valuable experience, but Lee insisted that a welder was the last thing in the world he wanted to be. Still, right after graduating high school, he went to welding school. “Welding is all I have ever done.” Lee said. And his brother? A retired metalworker. 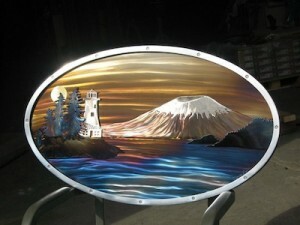 For outdoor signs Lee uses metal stain to achieve color effects. Lee dabbled with metal art over the years, but grew more serious after two things happened. First, a customer asked Lee to fashion a salmon to hang on a smokehouse he had just fabricated. Lee was impressed with his rookie effort. So when Lee returned to Sitka, he drew pictures of the Rockwell Lighthouse and Mt. Edgecumbe and made a cameo-shaped wall hanging incorporating the two images. People loved the pieces and he sold a number of them, refining his technique over time. Lee uses a variety of techniques to add detail to his renderings. His mountains, for instance, may be evoked using embossing and engraving, adding metal stains or even cutting out pieces of the background. In many of his pieces, elements rise off the background, giving a bas relief quality. But Lee’s neatest trick may come from his deep knowledge of what happens to the color of steel when it is heated. The steel turns an array of colors depending on the temperature. Lee said he can also bring out a red color, but that can be difficult. “Red is in a very narrow heat range,” he said. “You can go from the amber to the blue and red is stuck in the middle and you don’t even see it.” Lee must know instinctively when to stop adding heat, for the metal will keep “cooking” for a while. Lee is not a big fan of new technology, but he does sing the praises of his Computer Numerically Controlled drafting machine, which allows him to enter his designs into a computer to make templates. Then, he can adjust the size without having to cut new pieces. Thirty-five years ago, Lee hammered out a tropical fish, thinking that making metal art might be a fun hobby. More than three decades later, he has become a true master of the medium.